This is the partially made hat. Notice how badly shaped the top is at this point. Not to worry, as you can reshape it at the end, then let it dry before dying or painting it. Mine was airbrushed with thinned acrylic paint. How can you tell if leather is vegetable tanned? It should be the same color as the last picture above, and when you get it wet it will darken where it absorbs water. If you lick your finger and stick it on the leather it should leave a dark mark. Oh, wow, this is just what I've been looking for! I've been looking for a tophat for years now, but finding one under $100 (that isn't made of felt and cardboard) has been impossible. In any case, this one is far closer to the look I'm going for then a store-bought one. I'm going out tomorrow morning and getting the leather. you are so generous to share your designs. thank you very much! Very cool. Someone just gave me a whole bunch of leather, though I am supposed to make books out of it . . . Thanks for posting this. Thanks, Tom! Your work is astounding. I work for Micro-Mark and just got a bunch of resin to start experimenting with. Your blog has been one helluva inspiration! amazing, thats just so cool! How did you do the details around the edge of the rim? Tom, are you interested in making more of those. Yes, I expect I will make it again. Sir, my little brother is practically begging for a top hat and after searching around the net and looking at many designs, yours in by far my favorite. I am wondering, if one of your hats is for sale, how much it would cost to buy one for his birthday? I make them for $225 which includes a sweatband but no liner. Question about the pattern, however: The fleur de lis motif around the bottom of the crown; is it additive (added to the inner circle as the pattern is cut) or subtractive (cut from the circle as it exists)? Thank you. I appreciate that. I will try to save up by July! I can't tell you how grateful I am that you're willing to share this with strangers. You are a truly rare person on the internet. This is just awesome. I can't believe a resource like this exists. You're the best! Oh WOW!!! 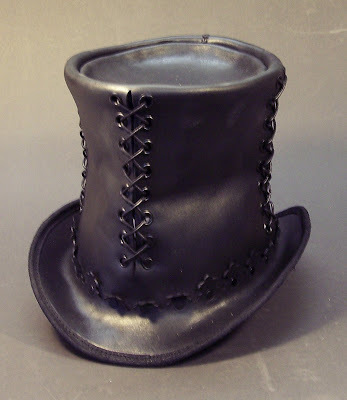 This is by far the coolest leather top hat I have ever seen! I like it even more than Baron's "Fanciful" leather top hat (which costs $650 I might add) Thank you so much for sharing your design! Thank you for posting this. I shall be ordering one once I get an extra $200 bucks! If I made it it would be crafty not crafted. Also what tools would you need to complete this project? I was wondering if you could possibly answer Sarah's question about the cut of the arrow shapes at the base of the crown. Are they cut from the Circle that is already there or is it subtracted from the part that has already been cut out of the middle? ANd if you are so inclined to tell, how are they cut out, is it a specific tool or do you just free hand it with something? The fleur de lis tabs are part of the brim. The brim overlaps the crown and is attached with rivets. Normally one would cut an oval out of the brim that is smaller than the base of the crown, and in this case rather than making this a plain oval I made it decorative by making the overlap a series of fleur de lis. I cut the leather using a laser cutter. I just finished a top hat which I built using your design. Thank you! I'd love to send you a picture of it. I'm rather proud -- this is the first major leather project I've ever done and it came out really well. Tom is the Pattern to scale...Meaning if I take it to a print shop and have it blown up to make the crown 24 inches from end to end will the other peices in the picture come out to the right size? Yes, the bottom pattern is to scale. This is wonderful - I am going to use it as a guide to make a slouchy crushed fabric version. Of course the fabric will have to be doubled and the hat lined. So when making this hat I have found that the brim cutout is too small when printed up to size. Can I correct this by making the inside of the brim the same as the top? I have the crown to size for my head. 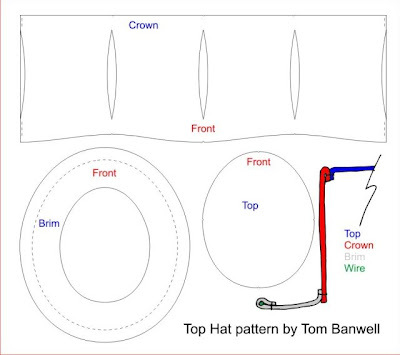 Terry, are you aware that the inside of the brim must be stretched to fit over the crown? No I was not aware. First time attempting a hat since I was very young playing with cardboard =) So Im not sure about the complete process. Terry, the wet veg tan leather is quite plastic and the brim should stretch fairly easily over the crown. It helps to have a head form to work on, or you could use a plastic bucket. Ahh thank you for your insight. I will have to try that on the second make =). I fear I went with the wrong kind of leather. But thats ok live and learn. I got to say I was very impressed with your display at the nova Albion Con. where would i source this kind of leather from? I'm starting mine today! Just picked up my leather at lunch, and I'm psyched! Tom, I think I've become your biggest fan over the past week. Your art is just absolutely breathtaking. DO you have this hat for sale? I looked through your Etsy page and did not find it. Sorry, I am no longer making hats to sell. Thank-you for sharing this! 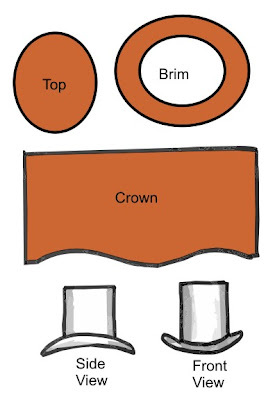 I used this tutorial to make a top hat for a custom steampunk barbie I'm creating. It worked great! Great pattern Tom! What size grommets did you use for the darts? @robotmastern That would be fine. I just made a riding one (my first hat) with 8oz leather, i love your design, and will make one with my 8oz leather. 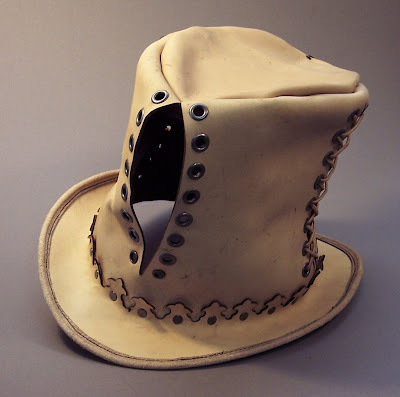 Is there a good page with instructions to shape the leather hat after it's completed and before dying and painting? Do I just get it wet and shape it, and let it dry? Thanks! John, you can stuff it full of towels to help hold its shape. Otherwise just wet it and let it mostly dry out till it will maintain the shape you give it. Tom, thank you for your advice. I am actually making the hat now. I have all the pieces cut out, so it will take me a couple days to assemble them, and also to bevel the edges. I'm using heavier leather than you suggested, and therefore I must make some small changes. If I may bother you with one more question: Do you have any advice about making the sweat band? I don't care about lining, but do you make a band inside the hat where it touches the head? Thank you in advance, I have so much respect for your work! You're a true master craftsman. John, you can just cut a strip of leather and glue it inside the hat. Thanks Tom. I will email you photos of my hat. It is taking me a few days because I am engraving designs on the four panels of the crown. I am so excited about this hat, like no other project before. Once it's done, I will toast a glass of wine with my Steampunk friends to your good name. Cheers! Tom would you mind sharing a little info on the laser cutter? What wattage is it and what type of laser? I have a Universal Laser with a 40 watt power. You can get by with less. 25 watts will cut fine, just slower. Thank you Tom. I really appreciate it. I was wondering would leatherette work as substitute? Not very well. It won't absorb water and become shape-able the way veg tan leather will. Hello! Quite enjoy your work! :) Had a question for ya though. I'm a bit new to the leather crafting world and am trying to soak up every bit of knowledge I can. First...when do you soak your leather? Do you soak the entire thing and then outline and cut out your pattern? or do you cut the pattern then soak it? or...do you put it all together and *then* soak it to form? Also...do you simply soak it and form...or do you use another method such as soaking then boiling for a few seconds. Do you dry it with heat such as in an oven? Wow I honestly didn't intend on asking so many questions. If you have the time to answer them I would be outstandingly appreciative! I draw out my pattern, cut it, soak it in water and hen stitch it together. It is much easier to stitch while the leather is damp. After making a hat following the template you have provided I can fully appreciate the experience and quality of work that goes into your craftsmanship. Thank you for providing the template, I would have had a much more difficult time without them. I made a couple hats using your pattern, and I figured I'd show them off here. Thanks for the great tutorial, and for being a great inspiration to me in my leather working. Can we dye the leather before assembly? If so, how will this impact the wet forming process? Can we dye AFTER assembly? I don't have the equipment to spray paint. It is best to dye after assembly as the dye does impede somewhat the absorption of the water, but it still works. Mister Tom, i was pretty amazed with your work :), and this hat is my favorite, i wanna learn the art of leathercrafting, so i made one for me, but i have a little problem about the color, how could i give the intense black color to the hat? should buy an airbrush with thinned acrilic paint as you said in your tutorial? if so, how could i thin the acrilic paint? in order to get the intense black color in the hat, i´m sure that, its not water; would you mind answering my question, please? i´m so exited about it^^ Thank you in advance. I thin acrylic paint with just water. I'm almost done my first attempt at creating this hat. I ended up using 3-4 oz leather and although it's more stiff, so far it's working out very well. I did have some concerns with the brim stretch/line-up/stitching process, but that too went well when you take one step at a time. I do have one question, and I suppose the answer isn't critical, but I am curious to know and want to get it right: what is the gauge / type of wire you used for the brim? Thank you so much for providing this pattern! I think it was 14 gauge steel wire. Tom? Have you ever made a leather bowler? Will a one piece crown stretch and take the shape of the bowl? Clint, that would be really difficult to do in one piece. It could be done in two pieces, but of course that would change the look of it. Hi Tom, just found your post. Thank you very much! I wonder if you could help me with the sizing a bit, please. It sounds like since the brim is going to fit over the crown, the cutout for the head will stretch a bit (or I'll cut it if I decide to rivet. Then to ensure that the hat fits my head, I should be sizing it according to the crown... As in, make a crown model out of some paper and see if it fits. I assume make sure it fits a bit loose, so that there is room for a sweatband. Does that sound about right, or should I be sizing it differently? I immerse it in water and then towel dry it. Rhino Gas Mask: Whither Points the Nose?